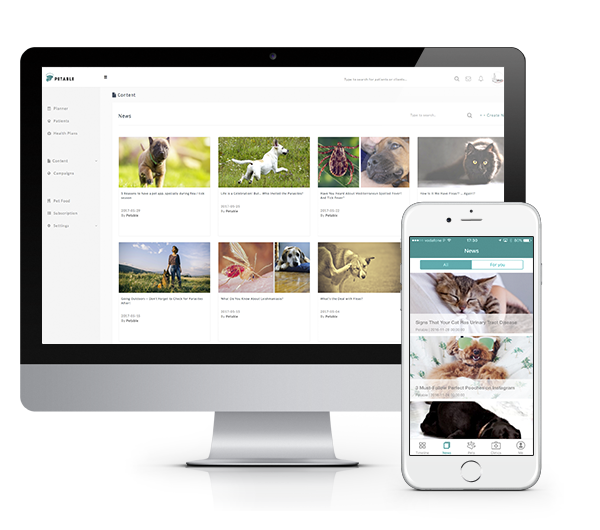 Petable is a preventive healthcare platform that combines the benefits of a cloud based backoffice for veterinary clinics with a comprehensive mobile app, that pet owners use and love. We don’t just say WHEN. Petable was created by a team of veterinarians, and is supported by a network of vet clinics. We make sure that whatever we suggest your clients for your patients’ life is always the best, with the full support of our network. 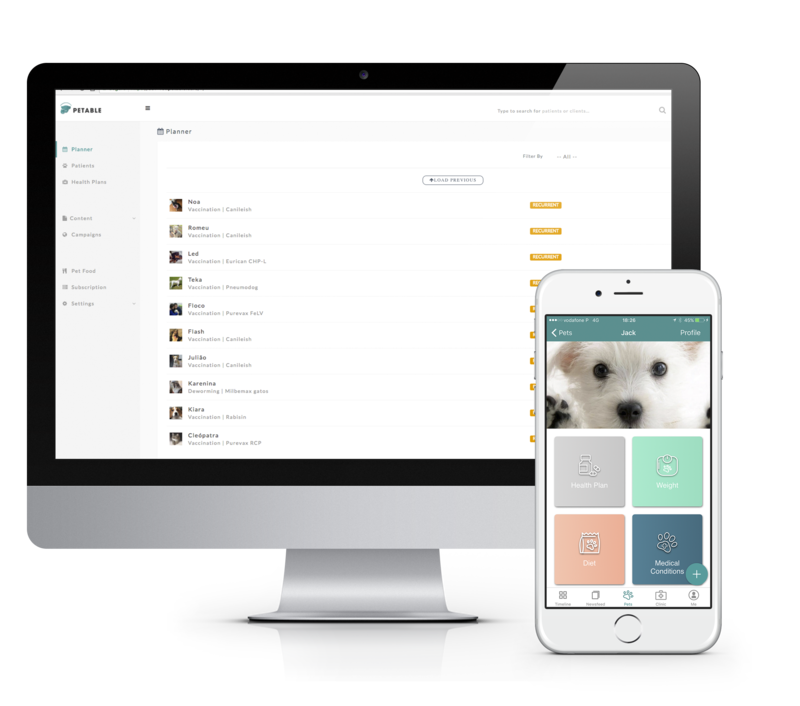 Your clients can track everything they need and want regarding their pets in one single place. We take care of checking if everything is as expected. We help them remember. We help them care. How do you explain to your clients why deworming is so important? Why is frequent exercise relevant? How does petfood balance everything out? This is why Petable exists. Your clients will understand the benefits behind every single event in their pet’s health plan. With PETABLE, pet owners learn about and keep track of all important events. Provide your clients with a tool that connects with their social network and encourage them share your contents, suggestions and information. Support your clients' love for their pets, as Petable allows them to share photos and all those special moments. Closer to your clients, empowering your services. Making you more present in your clients’ day-to-day life is a priority. Providing your clients with a connection to the most important professional in their pet's life, is a big part of what Petable does. 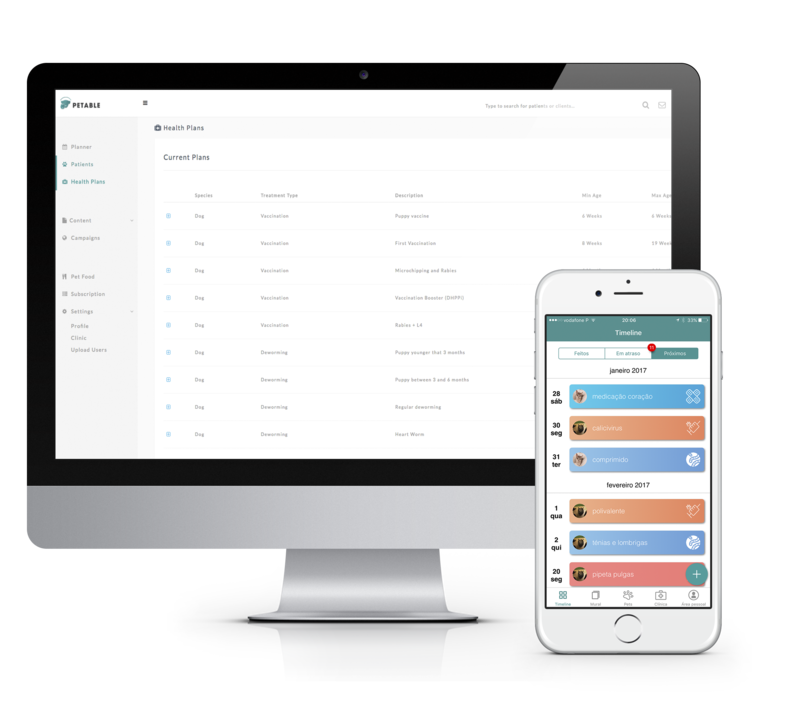 Petable helps you keep a close eye on your patients. You get a direct connection with all your clients. Petable allows that your clients treasure every moment spent with their pets, without any worries or concerns. We give you clients their pets’ lives in their hands. Pet owners input the general information through the App, trouble free for the practice. Your practice can manage the information, correct and update it. Practices and pet owners can manage health plans, so it's a two way CRM tool for practices. Your practice benefits from increased control over your patients’ health plan compliance. Use the NEWS tab as a customized communication channel for your Practice’s campaigns. Promote health care with the content that you know is relevant to your clients. Serve them the pet info they really should be reading. You will not be charged if you cancel before your free trial expires, 30 days from the time you sign up. Cancelling from GOLD subscription still gives you access to the FREE version. Once you have registered with Petable you will be granted a 30 day acess to our GOLD Plan to manage your Practice's Backoffice. Near the end of those 30 days you will receive an email asking you for payment information to keep that subscription active. We remind you that you may keep using Petable on the Free Plan, free of charge. In case you decide Petable isn’t for you, you may cancel your subscription anytime at the settings menu inside your backoffice. Which methods of payment do you accept? When will I be charged for the subscription? We accepted SEPA and credit card payments. You can always update your billing information whilst logged in to the Backoffice. You can also opt between monthly or annual subscription. Annual subscriptions receive a 10% discount. Because even though you can start using Petable FREE right away, we want you to get to know all the features that you have on our platform, so that you see for yourself how awesome it is. Does the free account allow unlimited reminders? All Petable plans include unlimited health care reminders, your clients will never forget another vaccine or deworming.